Feeling a bit like an expat in my own country of birth after four years in London, I decided to seek out the best of the best in British fare the concrete jungle has to offer. After a not so savory experience at the Spotted Pig last Christmas (read my musings here), I was hesitant to try The Breslin, one of British chef April Bloomfield’s Michelin- starred establishments located in the Ace Hotel. However, in an attempt to be optimistic for a change, the beast boldly ventured out to the latest gastropub-grub style establishment decked out in pictures of cows, deer antlers and various pig figurines dotted all over the bar and dining room. There are little nibbles and bar snacks on offer which is what comprise the entirety of my meal on a boozy Thursday or Friday in London anyway, though, these snacks are far more filling and pleasing to the beast’s snooty palette than a “liquid dinner” consisting of multiple pints of lager and 10 bags of Walker’s crisps (not that the beast doesn’t enjoy that too but there’s a time and a place). There’s bombay mix and caramel popcorn, spiced almonds and scotch eggs, beef and stilton pie and crispy fried lamb “scrumpets” with mint vinegar. Very displeased to hear that the pork scratchings were removed from the menu (even though the waitress told me they were April’s favorite and she would tell her a customer was asking for them), I elected to order the boiled peanuts fried in pork fat ($7). 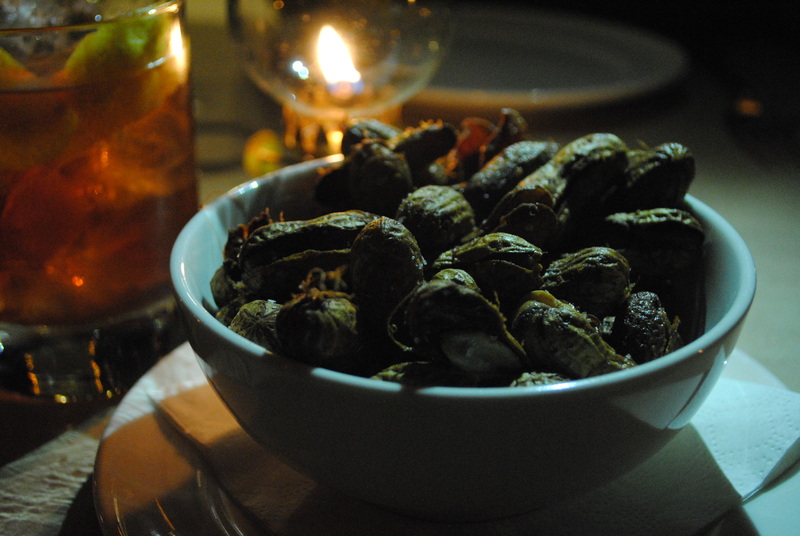 The strange thing about these peanuts is, because they are fried in pork fat, you can actually eat the shell. Initially it is repulsive and then once you pop a few in your mouth, you can’t seem to stop, rendering this snack the gastropub version of Pringles (the salt content certainly seems the same). 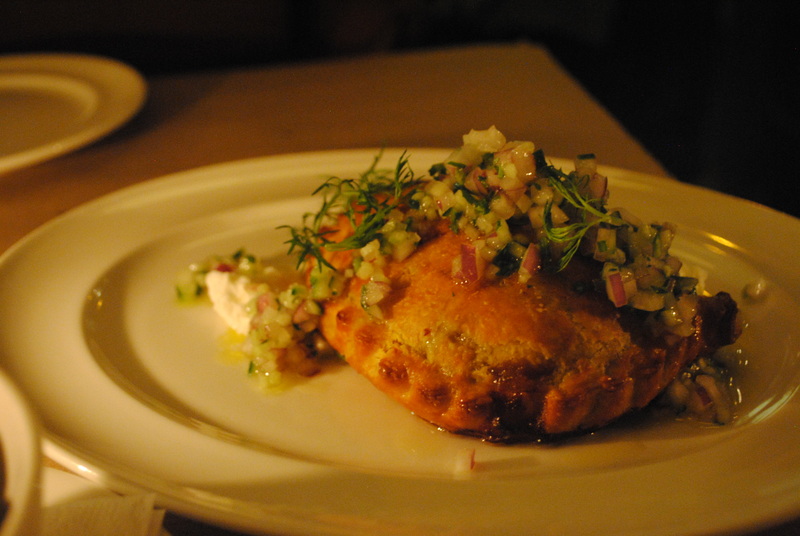 The curried goat pasty ($17) off of the small plates section is what I liked best. If there’s one amazing thing about gastropubs and pubs alike (I mean there’s many great things) but that there is always at least one, if not more, Indian-inspired dishes. Atul Kochar of Michelin-starred Benares in London reached his claim to fame by serving up modern Indian cuisine with a contemporary British twist, creating a whole new genre of Indian cuisine. In the same way, April Bloomfield almost does the reverse — serving up modern British gastropub fare with a contemporary Indian twist in this dish. By taking something as exclusively British (sorry, CORNISH), as the Cornish pasty and instead of stuffing it with steak and ale or cheese and onion, she elects for curried goat and it is absolutely perfect. This is not always on the menu so if it is when you go, 100% order it. 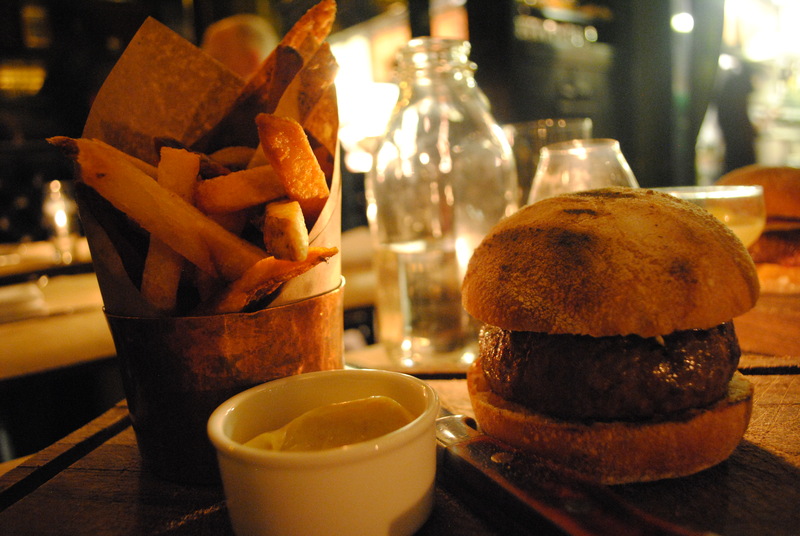 The chargrilled lamb burger with feta, cumin mayo and not twice, but thrice cooked chips ($21) is another winner. 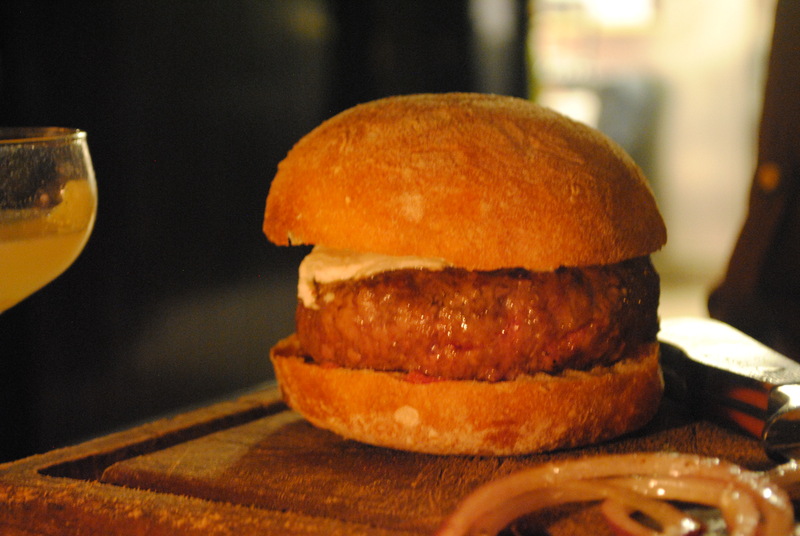 In an over exhausted burger market, I’d say the lamb with feta makes a welcome change from the worn-out ground beef and cheese duo. Again, the decor of the dining room is a far cry from the London pubs with their general hodgepodge of furnishings: gloriously comfortable battered mismatched chairs, rickety wood tables, tired old booths and beautifully glossy bars with dark wood and a sense of casualness and relaxation — the booths in the Breslin are fitted with black and green leather banquettes and are far too posh to feel pub-comfy, the atmosphere more dive bar meets dining room feeling. 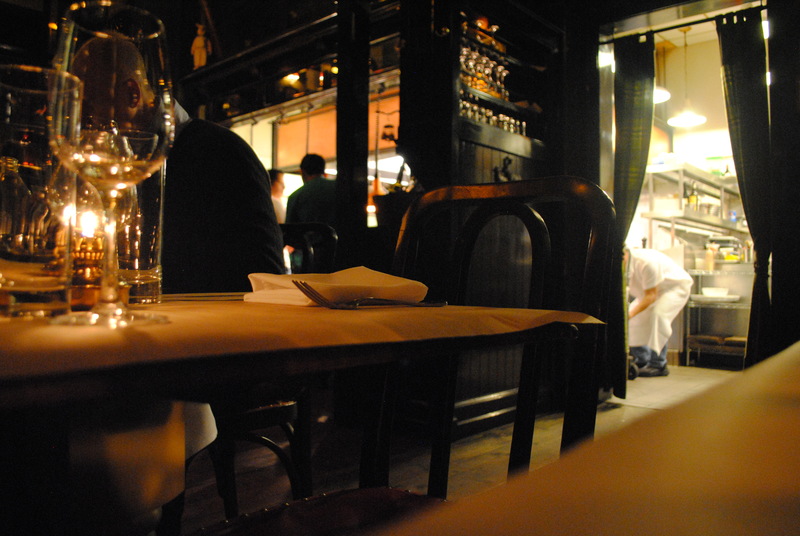 However, the waitstaff are not arrogant or pushy, which is always appreciated, and all seem to exhibit passion for the establishment when discussing menu options or making cocktail recommendations. Bloomfield offers up some lethal dining options for large parties, titled “large formats,” which consist of an entire whole roasted suckling pig or a balsamic roasted duck amongst other things. Must bring 8-12 people to partake. 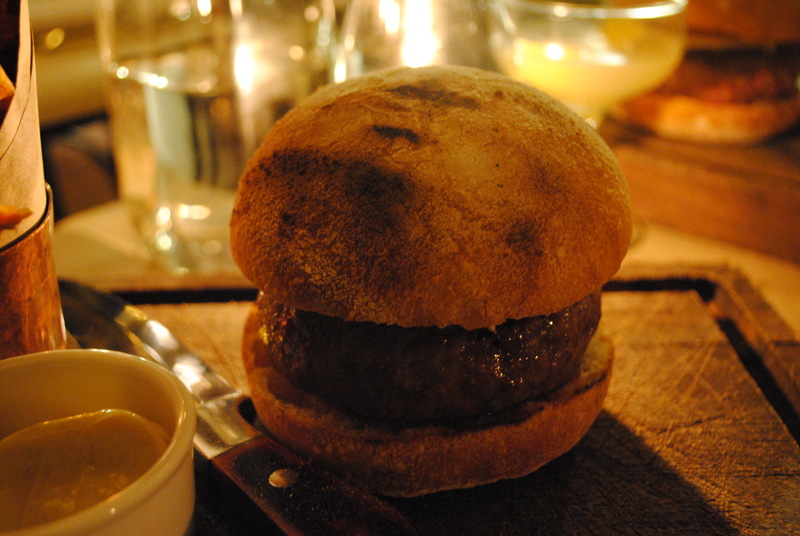 Posted in Restaurant Reviews - New YorkTagged Ace Hotel, April Bloomfield, bar, British, Gastropub, lamb burger, Meat, Michelin starred, New York dining, pig, pub, The BreslinBookmark the permalink.